When 18 year-old Christy O'Dowd ran away from his home near Shrule in 1939 to join the British Army, he knew he was likely to ruffle some feathers. It was certainly not a career path any of his seven elder brothers had considered. The family ran a small farm four miles from the village of Shrule, and there was no tradition of soldiering whatsoever in their history. Ireland was, after all, neutral and there was no need for any young man to fight for 'the auld enemy'. But Chris was a free spirit and despite being warned of the folly of his ambition, he was determined to proceed. He was well briefed in politics and world affairs and had developed a strong dislike to Fascism. He had learned enough information from the newspapers, and in particular from the Pathe news-reels he had seen at the cinema in Ballinrobe, to realise that Hitler was a huge menace to the future of mankind itself. Having first seen action with the Irish Guards in Norway, Chris volunteered for Churchill's new elite force, the Commandos, and after a period of intensive training he sailed to Egypt with them in 1941, serving with Churchill's son, Randolph and novelist Evelyn Waugh among others. Within a year however, the Commandos were disbanded and the men faced the prospect of returning to their parent regiments. But one young officer, David Stirling, had other ideas: He proposed a scaled down version of the Commandos, operating in small units and capable of infiltrating the enemy deep behind their lines. When his new unit was given the go-ahead, one of the first men he picked was young Chris O'Dowd. 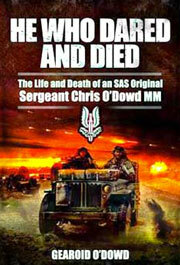 The Special Air Service or SAS, as it would become known, soon became a thorn in the side of the 'Desert Fox', Rommel. Following his outstanding performance on their behind-the-lines raids on enemy airfields, Chris was quickly promoted to Sergeant and awarded the Military medal for outstanding bravery. When David Stirling was captured the regiment's future looked to be in peril. However, his second-in-command, Ulsterman Paddy Mayne, succeeded in convincing the Top Brass that they should carry on with himself as leader. Mayne had played rugby for Ireland and would become one of the most decorated Allied soldiers of the war. He was soon leading his men as they spearheaded the invasion of Italy. Further success was to follow until tragically in 1943, Chris was killed along with fourteen others when they suffered a direct mortar hit while on a raid. In total 3,617 men from the Irish Free State gave their lives to thwart Hitler. Those who served and died from Mayo are honoured at the Mayo Peace Park in Castlebar. Among the names remembered in stone is that of Chris O'Dowd. 'He Who Dared and Died' is a fitting and long-overdue tribute to a brave young man who paid the ultimate price for his convictions.